Worth Remembering | "Dad, I left my heart up there." John Worth had been collecting his memories in recent months, publishing a “memoir” entitled “Worth Remembering” in 2010 for family and friends, then updating it substantially until a few days before his passing. Download Worth Remembering 2010. Please feel free to post any thoughts or experiences about John that you feel are worth remembering. 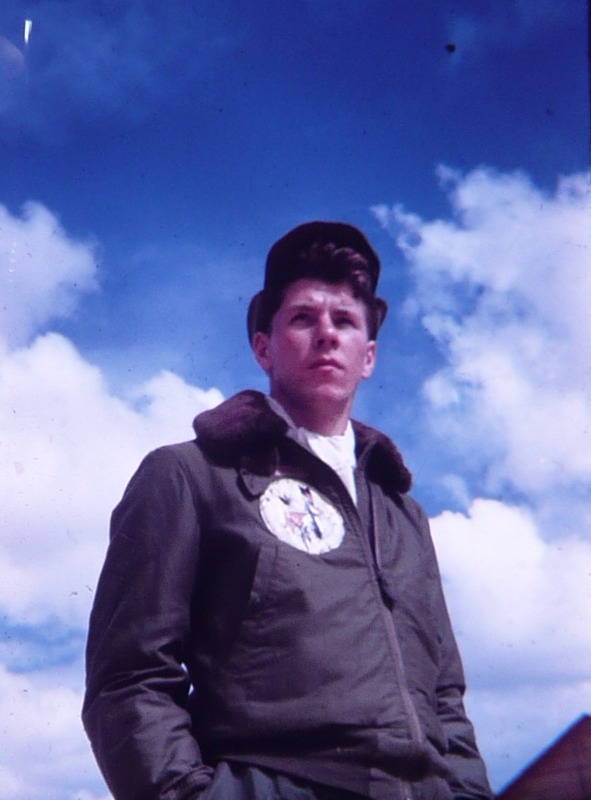 John Worth as an aircraft crew member in WWII. As Vice President of the Vintage R/C Society, one of my tasks is to chair the selection committee for the VR/CS Hall of Fame. I sent out a list of nine names; of those nine, three are selected for induction. After finally tracking John down asking for his vote, his reply to me was, “They should all be elected”. John was the quintessential modeler and leader and will be missed. I got to know John through his publication RC MicroFlight. Shortly after getting back into model planes after many years, and teaching myself to fly RC, I started reading RCMW. That led to me contacting John and buying all his old print copies of the newsletter. I built my first micro RC plane, with some parts I purchased from John at Cloud 9 RC, and became enamoured with micro RC. And, at the same time began a friendship with John. Before long I was corresponding with John, writing articles for RCMW, and seeing John at the NEAT fair. RCMF was shut down by AirAge, and John started up RC Micro World, and I continued writing articles for him there, and corresponding about my latest projects. In 2005 my club awarded him our annual “Excellence In Micronautics” award at the NEAT indoor night. More recently I would see John at the KIEF indoor event. Through all this John became a very good friend. Earlier this year he sent me a copy of his “Worth Remembering” autobiography. I couldn’t put it down and read it straight through. I wrote John that it was as good an autobiography as I’ve ever read and he should think about publishing it. Even as recently as a month ago I was trading emails with John. I will miss him very much. John was a friend who I respected a lot for his contributions to this hobby that we love so much. As ED of the AMA he contributed much and grealy helped a struggling association put model aircraft on the map so to speak. He surely will be missed and I extend to his family and friends the very best. I did not know John Worth, but I have the pleasure of working with Barbara as well as Christine. I know that anyone who raised such amazing women must have been an amazing person. I am sure his children are living examples of what a wonderful man he was. I know that he is looking down on them now with pride for the wonderful role models, mentors, and people he raised. My prayers are with the Worth family in their time of grief. They did a wonderful job on this site. What a great tribute to great person. Rest in peace, Mr. Worth. Just mention the name of “John Worth” and many of us are instantly reminded of the person that helped model aviation achieve the success it enjoys today. It reminds us of a kind, sensitive and brilliant person that you enjoy being around and associating with. It unfortunately now also reminds us of how tragic losing John is for his family, friends and the sport of Model Aviation. My family and I were fortunate to have been involved with John and the Academy back in the late 1960’s and to the present, when in the 70’s producing full production movies for nominal material cost of events such as the 1971 “RC Aerobatic World Championships”, The NATS, Contests and documentaries such as “Those Marvelous Miniatures”, “The Choppers”, “Diamonds in the Sky”, “The Good Brothers”. “A Plane, A Place, A Perfect Day” and many others including 10, 15 and 30 second spots to air on TV all for the purpose of promoting Model Aviation and the AMA. This PR concept was the vision of John Worth, then Executive Director of the AMA. I mention this as an example of the forward thinking that John pursued to help the image of the AMA and grow the membership. So many other benefits and implementations were started by John, full scale organizations such as the NAA and the EAA took notice and representation of the AMA was made possible. The IAC wanted to use our “Judging and Flying Precision Aerobatics” video. This was produced as a result of John’s earlier vision as to how videos/films back then/ could enhance the knowledge and image of the AMA. After John’s retirement from the AMA at which time he was its Executive Director, he never stopped “innovating”. He helped develop and promote some of the very early and successful miniature electric models and associated equipment. When most retiree’s would sit back in a rocking chair and watch TV, John was out at the flying field with the antique modelers making sure that everyone was having a good time. I was fortunate to have been associated with John for many years and it is with great sadness that we have to say “goodbye” and for me the end of such a privileged friendship. It is with deep regret for me to hear that Mr Worth has passed away. I am at a loss of words but Mr Worth was a blessing to me. I am from Hong Kong and bought from his Cloud9 mail order shop more than 10 years ago. He is a great gentleman. He did not ignore my order despite of the difficulties for overseas communication and shipment. Mr Worth will long live in my memories. Yeah, dad, I really miss you. The past year has been very different and at times, frustrating without you. I know you are there watching all of us and still out flying, only now at the best flying field ever. And I’m sure you’ve finally found all those planes you lost over the years! 🙂 I love you and miss you and think of you everyday. Love, mark. Hey Dad, as I’m sure you already know, I just got a new car to replace that old ford focus you helped get me when I moved back to Virginia! Yayayayayayayay!!! It was a good car for many years and I’ve always appreciated your help. So, I just wanted to thank you for that and let you know I’m doing good. Thanks, again, Dad and love you always. Give mom a kiss for me, too. Happy 91st Birthday, Dad. I sure do miss you. Wish you were still here. Give Mom a kiss for me.